A Sri Lankan girl has been named among nineteen young activists who are recipients of 2018 International Young Eco-Hero Awards for their impactful environmental projects addressing climate change, energy conservation, wildlife protection, landfill waste, and water pollution. Ranging from age 8 to 16, and hailing from around the U.S. as well as Australia, Canada, Columbia, Peru, South Africa, Sri Lanka, Ukraine, and the United Arab Emirates, these youth are being recognized by the San Francisco-based nonprofit Action for Nature for their creative projects aimed at solving the world’s environmental problems. 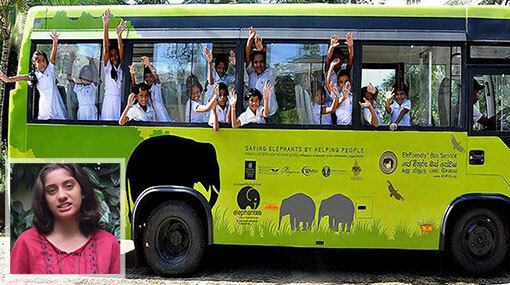 Anya de Saram-Larssen, age 13, of Colombo, Sri Lanka, addresses the conflicts between humans and elephants in rural Wasgamuwa by writing, speaking, and fundraising for an “elefriendly bus” which now safely transports school children who previously had to walk through an area where dangerous encounters with elephants have occurred. Stella Bowles, age 14, of Nova Scotia, Canada, was disgusted by the “straight pipes” leading from household toilets into the river that runs beside her house. She became a young citizen scientist, tested the water, publicized the results, and mounted a campaign to demand action. In response, the municipal, provincial and federal governments approved a $15 million plan to replace all straight pipes to the river with septic tanks by 2023. Now she is teaching other students to test their river water and challenge local authorities. Nikita Shulga, age 12, of Kyiv, Ukraine, noticed that classmates threw lunchtime food scraps into trash bins destined for the many landfills throughout his country, so he set up a composting program called Campola. Despite the fact that composting and recycling are not widely practiced in Ukraine, he knew that Campola could reduce the size of landfills, while the compost could be used to nourish trees that help clean the air. Starting at his own school in the fall of 2016, Nikita’s project expanded to 30 schools within the first year, and now the Ministry of Ecology and Nature of Ukraine is preparing to implement Nikita’s composting initiative across 1,000 schools. Charlie Abrams and Jeremy Clark, both age 13, of Portland, Oregon, are climate action campaigners and public speakers who have traveled throughout the state and beyond to lobby for environmental action.